Enjoy your family vacation in this incredibly spacious 7 bedroom home! With three levels of living space and enough beds for 22 people, Banana Cabana B is perfect for a large family gathering, plus it has an elevator. Family style meals are a breeze in this home's 2 full kitchens, and laundry is easy with the 2 sets of washers and dryers. You can cool off in the pool on hot summer days, or take a short stroll down the street to relax on the beach or swim in the surf. Myrtle Beach attractions and activities are just minutes away, while the unlimited dining options lie just down the road on Highway 17. Reserve your summer week now for the vacation your family will always remember! 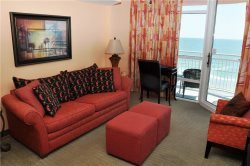 Banana Cabana B is close to everything you love about North Myrtle Beach! Shopping, dining and attractions are just minutes away.